"What was Nike thinking?" President Donald Trump said on Twitter last week about Nike's new ad featuring Colin Kaepernick. A new poll may provide an answer. Among people ages 18 to 34, 44% supported Nike's decision to use Kaepernick, while 32% opposed it, according to an SSRS Omnibus poll provided exclusively to CNN. In the 35-to-44 age bracket, the decision earned support among a majority, 52%, compared to 37% who were against it. Older adults were less supportive of the move: Only 26% of adults over 65 backed the decision. Nike (NKE) carefully weighed its choices with Kaepernick, and placed a strategic bet on the athlete-turned-social activist. Kaepernick— the polarizing quarterback who began raising awareness about police brutality and racial injustice by sitting and later kneeling during the national anthem at football games in 2016—announced the "Just Do It" ad with a photo on Twitter September 3. The ad provoked backlash from some who believe his protest during the anthem was disrespectful. Some people posted pictures cutting their Nike socks, burning their Nike shoes, and #BoycottNike started trending. Nike's stock is up since Kaepernick revealed the ad. The company's sales online jumped 31% after it was released, according to one analysis by digital research firm Edison Trends. Earlier this week, one investment analyst called the ad a "stroke of genius." A plurality of poll respondents, 41%, opposed the company's choice of Kaepernick, while 37% supported the move. The rest were unsure. But a majority of African-Americans and college educated Americans supported the ad. 68% of black people approved, while only 16% were against it. 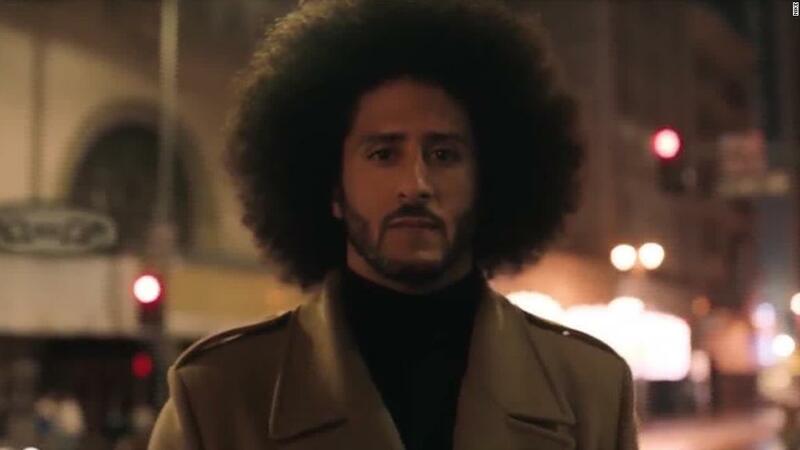 The poll also reflects a deep divide over Kaepernick along familiar political lines, with 74% of Republicans opposed to the ad, while 64% of Democrats backed it. 42% of independent voters opposed it. The poll was conducted by SSRS September 4 through 9 among a random national sample of 1,008 adults. They were reached by landline or cellphone by a live interviewer. The margin of sampling error for the poll is plus or minus 3 percentage points. —CNN Polling Director Jennifer Agiesta contributed to this story.